If you were looking for us on Saturday, you would have found us here causing quite a spectacle. 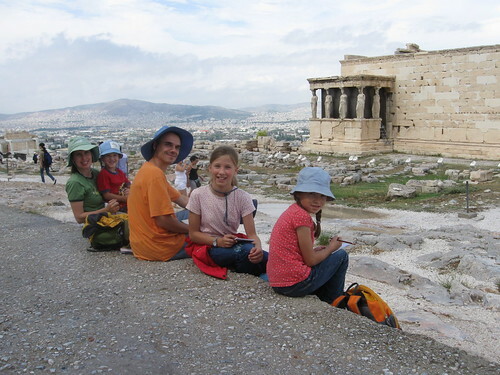 I'm certain the Acropolis has seen homeschoolers before, but for some reason we attracted quite a bit of attention. What were we doing that was so exciting?? 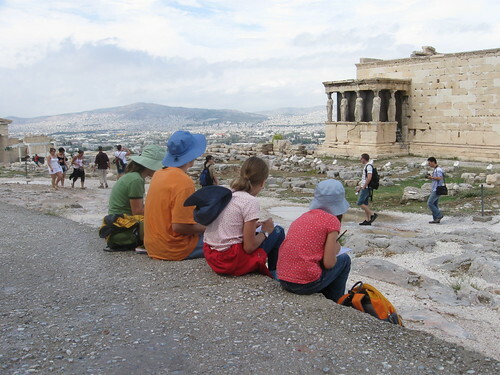 We must have looked rather curious, as lots of people approached us, including the Acropolis staff. They were horrified at the site of Kitty Bill, age 5, sitting with a tin of colored pencils and a notebook. They were concerned that he might go wild and start drawing on the gazillion-year-old marble rocks. 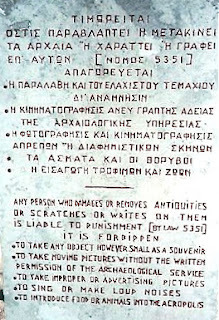 After all, defacing the place is punishable by law... apparently, so is singing.... which we do a lot. But we managed to restrain ourselves just this once. And rest assured, Kitty Bill was completely engrossed in drawing a picture of Lykavittos Hill that he didn't even think about drawing on the marble. It was a long walk up to the Acropolis. First in surprising torrents of rain, and then just as quickly, melting in the glaring sun. We stopped in the tiniest bit of shade cast by the Parthenon behind us, resting and sketching the caryatids of the Erechtheion. One woman was so taken with the sight of us that she thought we needed pictures. She grabbed our camera and started snapping away. Thanks, Bending Birches. You are so sweet!! You are in GREECE??!! I am so jealous, really, really! I don't believe in past lives, but if I did, I'd say that I was Greek many centuries ago. :) The Acropolis was the only place on earth that I had wanted all my life to visit. It was pretty perfect in '86 too. LOL! I like it how you trust your little boy to join in the drawing activity, despite those staffs who worried too much. I bet he had so much fun!! Izzy, thanks. He had a great time. I think he mainly focused on sketching a large hill in the distance. We had climbed that hill the day before, so he felt a connection to it I guess. And thank you, thefireflies! That's very sweet.